Hitch Rider Trike-N-Bike™ hitch mounted racks are available in three styles to best suit your transport needs. Trike carrier transports either delta or tadpole style trikes, and handcycles. All racks fit both 1 1/4" and 2" receiver hitches (patented). Roll Around™ trike rack handling wheels built into rack base (patents pending) makes moving the rack around, installing in hitch, and storing easy. Trike carrier is fully adjustable and accommodates trikes with a 33" to 63" wheelbase and 23" to 35" track. Wheel holders fit 16" to 29" size wheels up to 2.5" wide. View rack specifications. TB1-2SBP is the lightest (52 lbs.) and most simple option, suitable for all trikes and upright bicycles with top tube. Rack is a good choice for small SUVs and sedans. LB1-2TAB is a platform style 2 bike rack and includes a 1 trike 1 bike conversion kit and security cable. Suitable for one trike and one upright, tandem, or recumbent bike up to 74" wheelbase and any vehicle without a rear spare tire. TB1-2BSA longer bike support arms can transport up to two upright bicycles with top tube on a vehicle equipped with a 2" Class III receiver hitch. 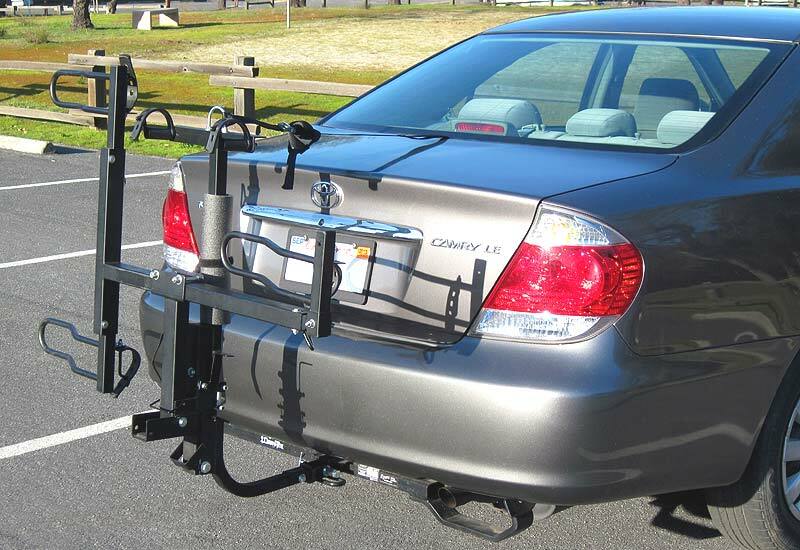 Racks can be used with front bike position removed and rack add-ons are available to handle various transport needs. Rack includes threaded hitch pin (Hitch-Vise not required), 1 1/4" solid hitch bar, and 2" hitch adapter. Locking hitch pin and security cable are available. 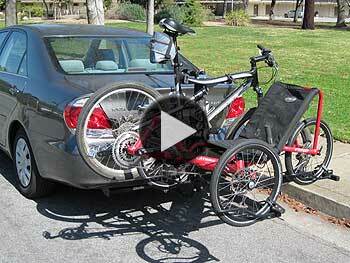 Rack add-ons and conversions for Trike-N-Bike Rack. Hitch bars for clearing spare tires. Trike racks ship within 1-2 business days via FedEx Ground. Shipping is automatically calculated by the shopping cart when placing your order online. Estimate delivery date and shipping.